Boeing has presented the first of 12 EA-18G Growler electronic attack aircraft to the Australian air force as part of a foreign military sales contract between the U.S. Navy and Australia signed in 2014. Australia will incorporate the Growler into its fleet of F/A-18 Super Hornet multirole fighter planes as part of its Plan Jericho program that seeks to create an integrated air force for the country, Boeing said Wednesday. 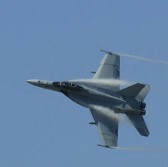 The U.S. Navy will subject the Growler to flight tests at the Naval Air Station China Lake in California and train Australian pilots at the Naval Air Station Whidbey Island in Washington state. Boeing said it expects Australia to receive the aircraft in the country by 2017.